Mr. Fejzo Begaj, Executive Director of “Livestock and Rural Development” Center (LRD), conducted a visit to Ireland from April, 27 to May 1, 2015. 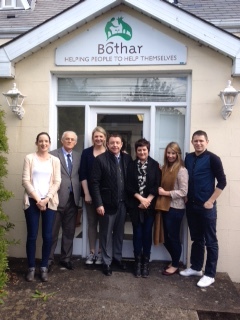 The purpose of the visit was the further institutionalization of the cooperation between Bothar-Ireland and LRD. The meeting was held in the presence of Mr. Dave Moloney the Executive Director, (CEO), Mr.Peter Ireton the Chairman of the Board of Bothar Foundation, and Bothar office staff. At the conclusion of the meeting was signed a five-year Cooperation Agreement between Bothar-Ireland and BZHR of Albania.